The HFP-100 series series has been discontinued. Please contact our flow dept. Engineering department. The HPF-110/120 series are compact, lightweight, self-contained portable testers with laboratory accuracy. Designed for fast diagnostic troubleshooting of all types of mobile or stationary hydraulic systems and components, makes all flow, pressure and temperature measurements simultaneously from one point. Helical type pressure gauge provides pulsation dampening and high over-pressure capacity. Additional features include pressure relief disc protection, and low battery/overrange indicators. Metric units also available. 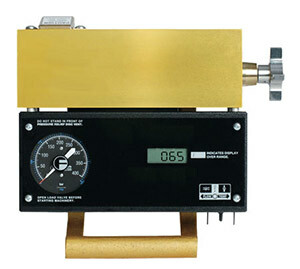 The HPF-100 series are all-digital, compact, lightweight, self contained portable hydraulic testers and dynamometers. Designed for fast diagnostic troubleshooting of all types of hydraulic systems and components, including engine-pump combinations. Makes all flow, pressure, temperature and power measurements simultaneously from one point, in either U.S. or metric units (switchable). Silicon strain gauge pressure sensor. This series also offers other standard features of HFP-110/120 series. However, the HFP-100 series is NOT CE rated. 참고: Comes complete with 2 "AA" alkaline batteries, and operator’s manual.